Ansible is a simple automation tool that automates software applications deployment, cloud provisioning, and configuration management. It's a server orchestration tool that helps you to manage and control a large number of server nodes from single places called 'Control Machines'. Ansible was created by Michael DeHaan in 2012 and is written in Python and Powershell. 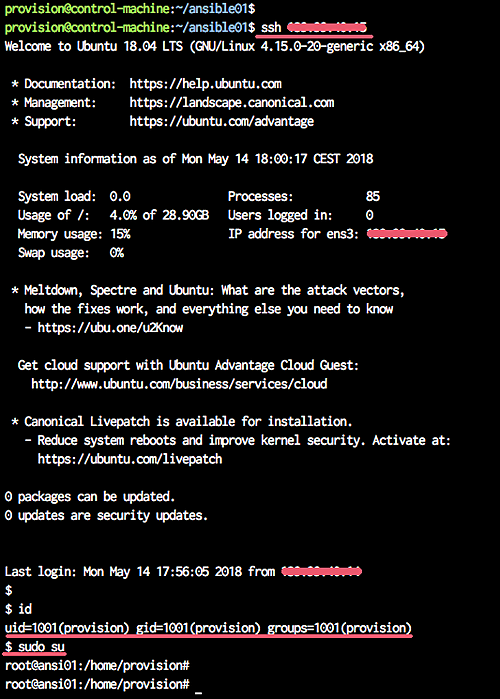 In this tutorial, we will learn how to deploy a new user and enable the SSH Key-Based authentication using the automation tool Ansible. We will also learn how to configure the Ansible 'Control Machine', as well as how to write simple ansible playbook. 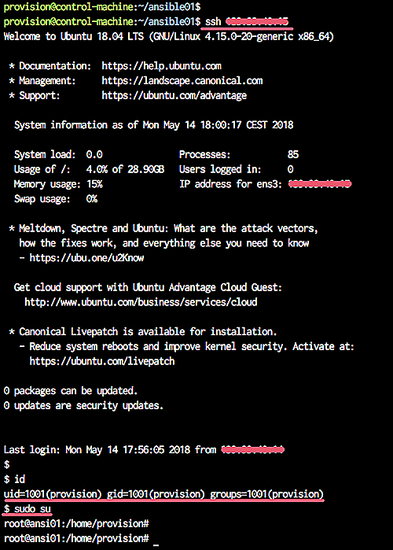 In this tutorial, we will be using the Ubuntu 16.04 servers as the Ansible 'Machine Control' and ansible hosts. The first step we need to do is to set up the 'control machine'. We will install python and ansible on the ansible 'control machine' by running the following command. After the installation is complete, we will add a new system user. We will add a new user named 'provision' in order to perform server provisioning using Ansible. Add new user 'provision' and give the user a password. Now add the 'provision' user for sudo without the password by creating new configuration file under the '/etc/sudoers.d/' using the command below. A new user has been created, and now it can use sudo without a password. In this step, we will define the user for ansible hosts. This user will be automatically created by ansible, so we just need to define the username, password, and the ssh public key. For each server ('ansi01' and 'ansi02'), we will create a new user named 'provision' with password 'secret01'. And we need to encrypt the 'secret01' password using the mkpasswd command. Encrypt the 'secret01' password using the command below. Make sure the 'whois' package is installed on the system, or you can install using the following command. And you will get the SHA-512 encrypted password. Next, we will generate a new ssh-key. Login to the 'provision' user and generate the ssh key using the ssh-keygen command. Now the user and password have been defined, and the ssh key has been created l(ocated at the '.ssh' directory). In this step, we will define the inventory files for all server hosts. Login as the 'provision' user and create a new directory for the project. 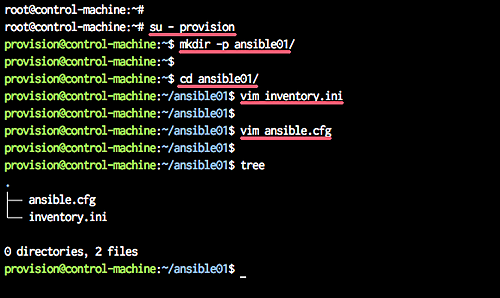 Go to the 'ansible01' directory and create a new inventory file 'inventory.ini' using vim. Now create a new ansible configuration file 'ansible.cfg'. The ansible inventory file has been created, and our ansible scripts will be located under the 'provision' user, inside the 'ansible01' directory. Ansible Playbook is set of instructions that you send to run on a single or group of server hosts. It represents the ansible-provisioning, where the automation is defined as tasks, and all jobs like installing packages, editing files, will be done by ansible modules. In this step, we will create a new ansible playbook to deploy a new user, deploy the ssh key, and configure the ssh service. 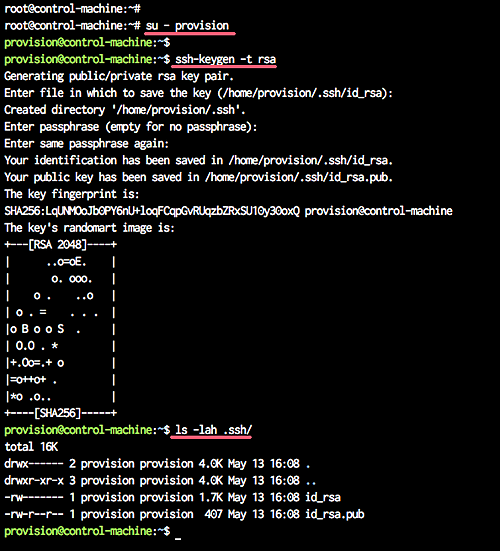 Before we create a new ansible playbook, we will scan all server fingerprint using the ssh-keyscan command as below. Those servers fingerprint will be stored at the '.ssh/known_hosts' file. If you have a lot of server nodes, you can save your host list and then manually scan the ssh key fingerprint using bash script as shown below. Next, create the ansible playbook named 'deploy-ssh.yml' using vim. Paste following the ansible playbook there. content: "provision  ALL=(ALL)  NOPASSWD: ALL"
we create the 'deploy-ssh.yml' playbook script to be applied on all servers defined in the 'inventory.ini' file. we create the ansible variable 'provision_password', containing the encrypted password for the new user. Set the Ansible facts to 'no'. Define the 'root' user as a remote user to perform tasks automation. We create new tasks for adding a new user, add the user to the sudoers, and upload the ssh key. We create new tasks for configuring the ssh services, disabling the root login, and disable password authentication. Tasks for configuring the ssh will trigger the 'restart ssh' handlers. We create a handler to restart the ssh service. 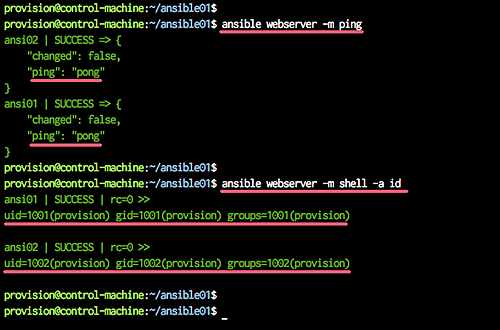 Login to the 'provision' user and go to the 'ansible01' directory. Now run the the 'deploy-ssh.yml' playbook using the command as shown below. Type your root password, and you will get the result as below. All tasks for deploying a new user and ssh key have been completed successfully. Now you will get the green messages as below. Now we can manage those 'ansi01' and 'ansi02' servers using Ansible, and the 'provision' user will be default user for Ansible. And you will be connected to each server using the default key '.ssh/id_rsa' file, and using the user 'provision'. 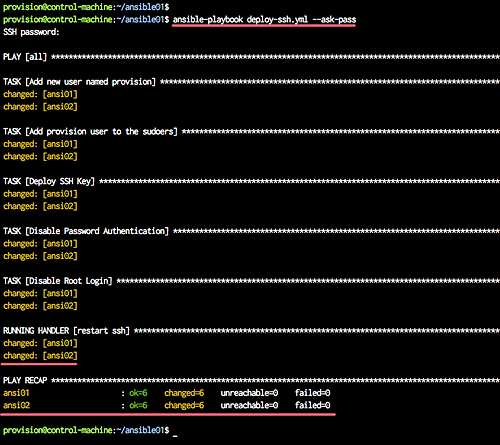 Deploying new user and ssh-key using ansible has been completed successfully. In the real world, where we have constant attackers, best to avoid simple accounts. 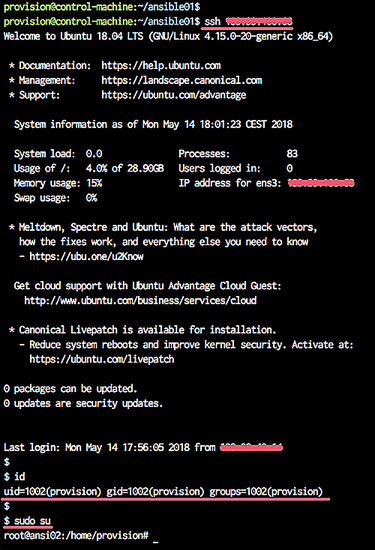 Always use a random account for ansible management on every host and let ansible deal with it. Adding a 5+ numbers to the end of the username is usually sufficient. Seems as if you did not keep the exact indention when writing the file. In .yml files, the white space and number of white spaces in front of the lines matters. thanks for given information . but i have to copy one file from one server to another server without asking password and we will use root access. it means i have to copy id_rsa.pub key on another servers in authorize_keys file . Here's the valid YAML as a paste on bastebin. Actually, the problem is that if you look carefully at the ansible.cfg above, it looks like the box below. Notice there is one space space before the word 'inventory'? Remove the space and save. Finished. cannot lock /etc/passwd; try again later.\n"
Either you did not run the command as root user or you have the passwd file opened in another program at the same time. Let me know Thank you. Also as a suggestion add to the requierements list to install "sshpass" package on the control machine other ways the command will fail with: "password option requires package "sshpass" to be installed. It just need to be intalled on the control machine. To execute my playbook as root user , control machine public key has to be added in authorized_keys file of /root/.ssh/authorized_keys ?? This article should never have someone edit the sudoers file manually. especially in a how-to. Mistakes can be made that would break sudo completely and require intervention at a console level to fix, or if you're in a cloud instance with no console to possibly have to re-deploy a new server.